3 visits with you before your due date. At least one visit to meet your partner. They can be in your home, at a doctor or midwife visit or another location, such as a coffee shop or library. At these visits we get to know each other and I become acquainted with your ideal birth day. I will help you create your birth plan, offer nutrition and exercise suggestions and answer any questions you may have about birthing. My goal is for us to feel completely comfortable and create a trusting relationship with you and your partner. This will ensure the greatest outcome for you and the birth of your baby. Unlimited phone contact with me with questions or concerns. I will be available to you around the clock, via call, text, email or video call. If you would like to discuss your recent prenatal check up or have any concerns that are non-medical or wish to share an idea you have about your birth plan, I am here for you as your Doula. Help writing your birth plan. How you want your birth setting, with music, special oils or aromas, body touch, focal object(s), is important to be known to your partner, Doula, hospital staff and doctor. I can help you gather ideas and write them down. Every mother deserves to have her desires recognized. It is your birth day, plan it your way, make it your "chosen path." On call when labor begins, and present throughout your labor and delivery. Once your labor begins you can decide when to call me. Perhaps you have decided to labor at home for as long as possible, or get to the hospital right away. I am ready to get to your side as soon as you are ready. Time with you after your baby is born to settle you both into nursing and a comfortable space. The first hours after your baby is born pass so quickly. The quiet and serenity in these moments allow you and your partner to capture your first glimpse of your baby. Skin on skin, putting baby to breast and "star gazing" invite you into this beautiful world of bonding. I will step away once you are settled into this space. I will be happy to take pictures for you during this time. 1 postpartum in home visit. When you are settled at home within the week after your baby arrives, I will come and visit you and see how you are doing. This is a great time for us to reflect on your birth experience. I will share my notes about your birth day and provide a copy of them for you to keep. I can recommend a postpartum Doula or lactation consultant for you at this time if you would like. Enter your information here to receive your free copies. There comes a time in the life of a human when basic care is necessary for his or her survival; Love, cleaning, but mostly nutrition. A most basic and primal function of mammals is breastfeeding. At its most fundamental, it supplies a perfect balance of everything a human (mammal) needs to grow and thrive prior to solid food. As a secondary function of primal mammal parenting, breastfeeding serves as a time to nurture and love our children as we watch them devour the liquid our very DNA causes our bodies to produce. Once upon a time I breastfed my children for 5 years combined between the two. I recall having no difficulties with passersby while doing so in public. I can plainly recall breastfeeding in such places as, the bench in the local mall, the airport, the grocery store while meandering the isles, the beach, in restaurants, even in the bank. I would never feed them in a bathroom, it was simply too full of germs in my mind. I would not eat in a bathroom, why would I feed my child in one? I have been trying to figure out what has happened in the 20 years since that time when public breastfeeding didn't seem to upset people. I wonder if it is the very invention that allows me to write this blog, the internet! 20 plus years ago, information was disseminated through reading books, speaking with a professional such as a doctor or the passing down of important information from a grandmother, aunt or mother. There was no sensationalism through this type of learning, it was simply received and the mothers who were lucky enough to successfully breastfeed did so without any fan fair. It just "was" what we did and it was accepted as the way to feed our baby. The topic of not breastfeeding in lieu of formula feeding is a subject of another blog. Not everyone can or will breastfeed and that is not for me to judge. Today the internet contains so much information that anyone can get an answer to when, where, how, why and what. While this is fantastic for the new mother wanting to discover all she can about the benefits of breastfeeding and parenting as a whole; the darker side of the internet may be tainting peoples' perspectives with the display of gross and outlandish videos and media. When a video airs about someone in shock or offended at something,or anything, it goes "viral" and causes something in some people to become inflamed. Sort of a "joining the bandwagon." Something as humanly primal and innocent as breastfeeding becomes the topic and place for such anger to be placed by the "new millennial" passerby whom once upon a time would mind their own business and keep on walking by with just a simple glance. I recall those glances and my natural response back was just a simple and gentle smile in their direction. My pure bliss was surrounding the event of my feeding and growing my own baby. The nutritional benefits of breastfeeding the young are perfect and the practical and cost effective benefits speak for themselves. My advice to new mothers in the era of public breastfeeding debate: Breastfeed your child on demand, when they are hungry. No matter where you and your baby are, stop and take the time to put baby to breast and allow them to eat. There are many cool fabric covers to drape over your shoulder, but if you find yourself without such a cover, put your baby first and breastfeed them. No debate, no explanation needed, no validation to seek, just nourish. The amount of time we spend breastfeeding our young is so short in the grand scheme of a human life. We cannot allow negativity to infiltrate our job as mothers nurturing our young. We must remember that the crazy and hostile views of this new era of public breastfeeding critics is coming from their own emotional junk and inner confusion and hate toward others. There is a place for old fashioned story telling as a way of passing along the wise ways of mothering. We must keep our future daughters and granddaughters (sons and grandsons) informed by teaching them about trusting their bodies as mothers. Through this communication we will keep and maintain love and push back the general hatred that seems to surround our current decade. As new mothers to be, we all have visualized how we would like to feel in our last few months of pregnancy and we have set up expectations about our ideal labor and delivery. It is a process in which we spend months planning and hoping for and so many nights we spend dreaming of. What happens when you get to that time when all ideals are halted in a moments notice? What happens next, what do you do with those plans and hopes and dreams? When your doctor tells you that you have pre-eclampsia and must spend your next four weeks in the hospital you experience a life changing event. In an instant your goals change, your focus becomes more clearly defined and you must make new plans, set your mind on new hopes and begin to dream and visualize your labor and delivery in a new light. Typically, preeclampsia occurs after 20 weeks gestation (in the late 2nd or 3rd trimesters or middle to late pregnancy) and up to six weeks postpartum (after delivery), though in rare cases it can occur earlier than 20 weeks. Proper prenatal care is essential to diagnose and manage preeclampsia. Pregnancy Induced Hypertension (PIH) and toxemia are outdated terms for preeclampsia. HELLP syndrome and eclampsia (seizures) are other variants of preeclampsia. Globally, preeclampsia and other hypertensive disorders of pregnancy are a leading cause of maternal and infant illness and death. By conservative estimates, these disorders are responsible for 76,000 maternal and 500,000 infant deaths each year! The answer to the question, "What Happens When" comes in a single moment. You wait patiently for your inducement, which may be weeks away, all the while you read everything you can get your hands on. Your goals, plans and dreams are ultimately unchanged regarding your baby's safe arrival, however you come to understand that you are facing an early delivery of your child and that the reality of an ever more painful labor and greatly increased chance of cesarean section are what you WILL plan for. Sometimes we must make choices that we simply did not ever dream of. It is important to surround yourself with a caring team to nurture you through this change of events and during your labor and delivery. It is okay to seek support beyond your doctor and family. Adding a Doula to your care team may bring you the greatest level of support because she will be there for you and focused on you and your comfort and for moral support. With the myriad outcomes possible for having a baby, we can never stand in judgement of another women who must deviate from her original plan for a "natural birth." Every woman will choose her path to deliver her baby based on the facts about her condition or based on her own sense of well being. Back to the ultimate goal, plan and dream; To bring forth a healthy baby and a healthy mother through the process of childbirth. My goal as your Birth Doula is to nurture you through this process. However your goals,plans and dreams become a reality, it is your Chosen Path. In 1989 I was a banking professional and ready to have my first child. From my first touch of Trevor's skin I fell in love with my son and the world of childbirth. Little did I know that a few years later I would be asked by a friend to assist as her Doula at her own birth. I discovered from that first Doula experience that I felt comfortable in my role as a labor coach and that I had an ability to comfort and reassure women before, during and after their labor. My friends encouraged me to practice as a Doula and they would seek me out for advice and comfort during their child bearing years. In 1991 I birthed my second born, my angel Spencer, in his 37th week of gestation. He passed away while inside of me. I made the journey of delivering him vaginally with the help of induction measures to help my body start the process of contractions and labor. My reflections surrounding his birth have been rather extensive and have brought me to a place of Bereavement Doula Work. My third son, my home birth, was my final triumph as a woman in her birthing years. My husband, Robert, our son, midwife and doula were present to help me bring Myles into this world with ease and swiftness. My water broke while I was walking in my beautiful backyard. I remember I was holding onto the post of the swingset during a great contraction and it just burst into the grass. It was after 1am as I called out to Robert that I had just fertilized the lawn. With barely time to spare, my baby was born on my living room floor by candle light in the peaceful hours of the night. An hour and forty minutes of labor, an hour of postpartum time for our midwife, Beverly to care for our new baby and me and we were tucked into bed comfortably and asleep before long. As the years went by, I was asked by different women to be with them at their births. Attending at homebirths, hospital births, natural, induced, or epidural, it didn't matter to me as long as I was able to comfort the mother and help guide her along her personal journey of birthing her child. We were a homeschooling family, not religious, not overtly naturalists, just middle of the road in ideology. However, regarding my family I was very hands on and discovered my independence regarding healthcare, childcare and education. During this time of raising my family I assisted at some births, however I put becoming a full time Doula on hold because I knew that I would not be able to figure childcare for my kids if I was on call and had to be away. Upon entering my middle years and acknowledging that my children were now grown men and living on their own and self sufficient, I came face to face with the fact that I needed to re-define myself, to find my purpose again and offer something of myself to others. I discovered after my kids moved out on their own to lead productive lives that I had fulfilled my purpose as a mother. Equally, having been a stay at home wife and mother and fulfilling all of my responsibilities in taking care of everyone and everything at home, I came to realize I needed to keep giving out to others, but how was the question. Contemplating all that I had accomplished, and all of my experiences throughout my life, I kept coming back to my love and joy that I feel through assisting women as they experienced childbirth. With encouragement from my family and friends I chose my new direction, my new path to personal fulfillment. 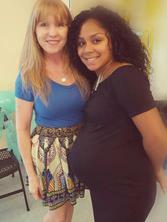 Born was the name, Chosen Path Doula Services. The name spoke to me in two ways, the first as it describes me, the second as it describes a woman's chosen path she takes through her childbirth. The name continued to resonate for me; I knew that was the right name for my new Doula business. I have a love for nature and butterflies and their metamorphosis to their higher purpose. The process of human childbirth is much the same for women and in light of that I asked my mother, Kay to sketch out a tree branch and butterfly metamorphosis. My logo was born from her beautiful artwork. I chose the Zebra Longwing as my butterfly because it is the butterfly for the state of Florida. If in our lifetime we can help others along the way by utilizing our own passions and strengths It is then that we have "morphed" to our higher purpose. It is my greatest desire to empower, encourage and gently nurture women during their birthing years. Thank you for reading my story and my reflection. Wife, mother, daughter, sister, friend: Doula.